Heading to Wine Country for the weekend? 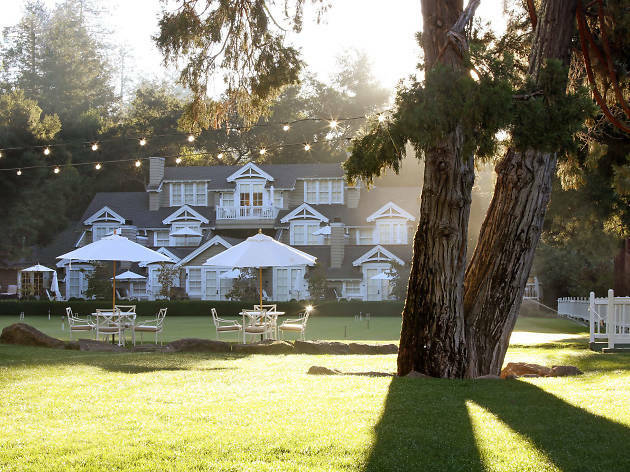 Check out our favorite Napa hotels for sleeping off that wine hangover. 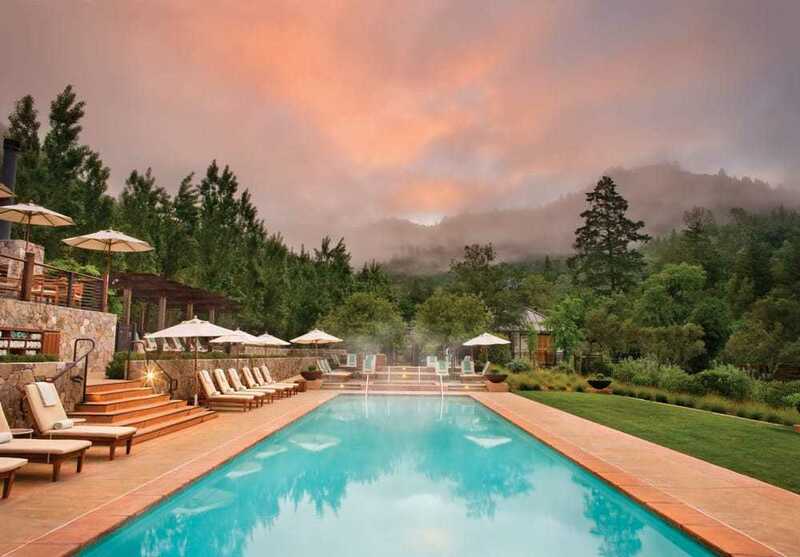 A trip to Napa Valley is not to be rushed; Wine Country is meant to be savored. 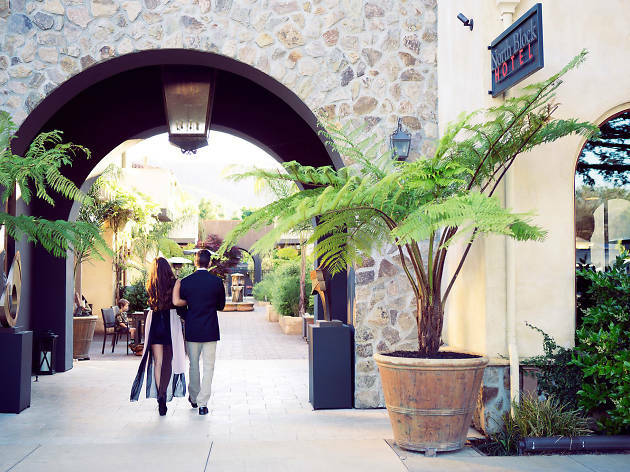 Thankfully, there's no shortage of standout hotels in Napa Valley for relaxing, swimming, and wining and dining in style. 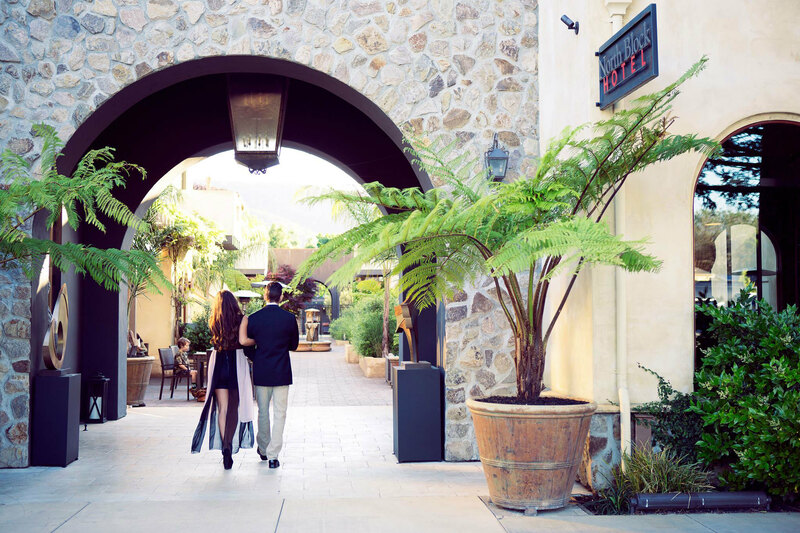 You'll find historic vineyard estates, stylish boutique newcomers, scene-y rooftop decks, and truly luxurious digs. (Soaking tub with a view, anyone?) 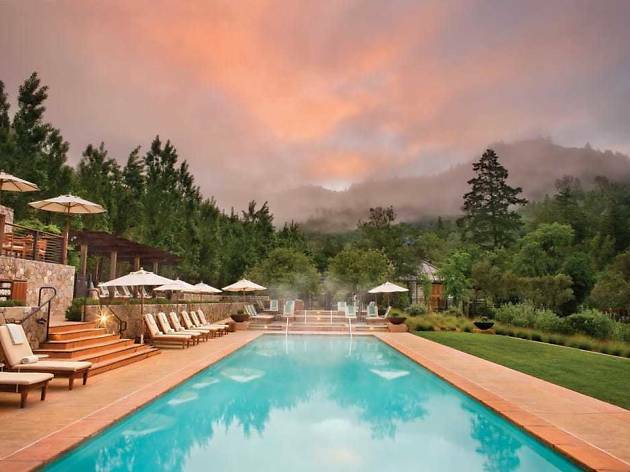 Here are the best places to stay in Napa Valley. This woodsy estate sprawls across 250 acres of oak groves and four miles of hiking trails. The 85-room property is well-equipped—spa, Michelin-starred restaurant, golf course—but still feels tucked away and intimate. Rooms, cottages, and lodges are all are outfitted with wood-burning fireplaces and private balconies. The pool area just completed an overhaul in 2018 to upgrade its 75-foot swimming pool, cabanas, lounge, and fitness center. Complimentary perks include wine receptions, bike rentals, and daily yoga and cardio classes. The main building, a renovated Georgian Revival farmhouse built in 1907, retains its original charm, including stained glass detailing and a wraparound porch. 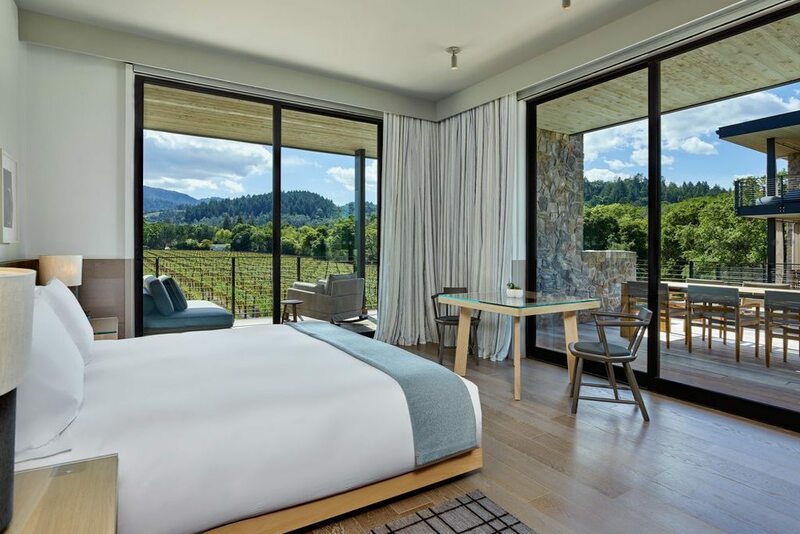 The property abuts Beringer’s century-old vines, and floor-to-ceiling windows in the guest rooms provide picturesque views. All 68 rooms feature Rivolta Carmignani linens, flat screen TVs, and modern furniture designed by Casa Zeta. Opt for one of the six Acacia rooms, which also have private terraces with fire pits and deep freestanding bathtubs overlooking the vines. 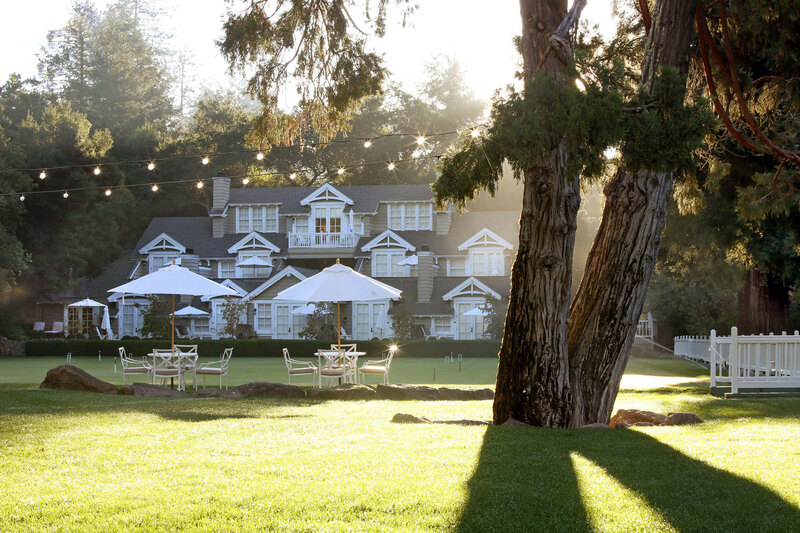 The on-site restaurant, Acacia House, is helmed by chef Chris Cosentino, best known for Cockscomb and Boccalone in SF. 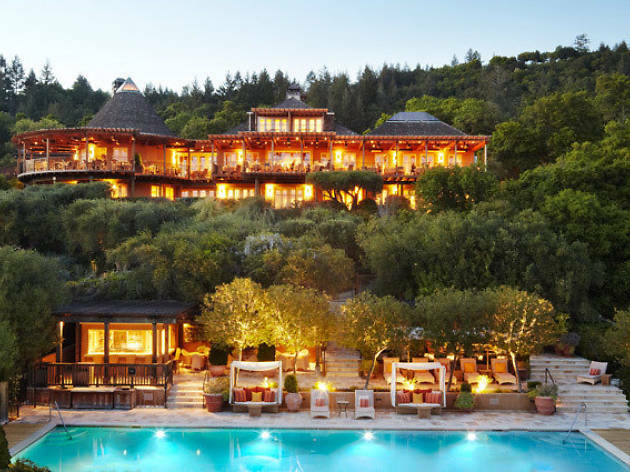 This long-revered Napa resort is set among 33 acres of vineyards and olive groves. The property includes 50 rooms, suites, and extra-roomy maisons, each tastefully decked in neutral tones and exposed wood. Most have soaking tubs and gas fireplaces, and all offer convenient extras like Nespresso machines and complimentary wine and cheese platters. Request a table on the terrace at the hotel’s Michelin-starred restaurant, which offers gorgeous views all the way to the Mayacamas Mountains. 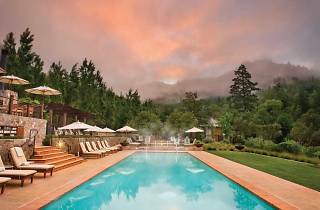 Then spend a day lounging at the hotel’s 7,000-square-foot spa and Instagram-famous pool area. 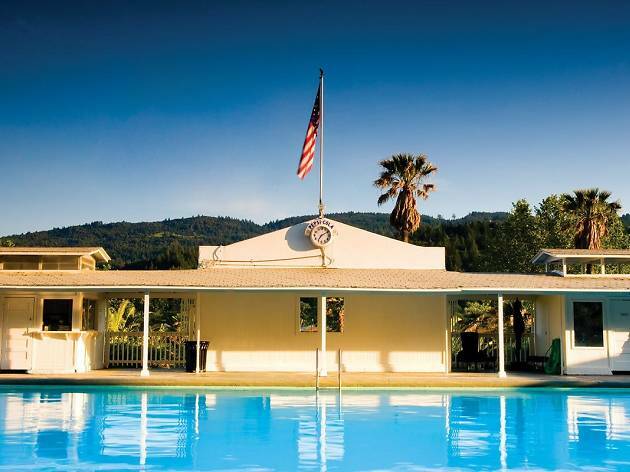 Calistoga Ranch is made up of 50 stand-alone lodges, making it ideal for private getaways. The 157-acre estate was built it 2004, originally as the sister property to Auberge du Soleil (though it was put up for sale in 2017). The wood-swathed lodges are extravagant odes to indoor-outdoor living, including floor-to-ceiling windows, outdoor living rooms, patio fireplaces, grills, and open-air showers. (Even the fitness center includes a yoga deck and two outdoor pools.) The bedrooms spaces, meanwhile, are outfitted with Italian linens, gas fireplaces, and luxurious soaking tubs. Should you decide to leave the cozy confines of your lodge, the property features miles of hiking trails, a wine cave and on-site vineyard, and a heated outdoor pool. What started as a quaint, 25-room inn in 1975 has grown over the years into a 78-room estate. The newly updated dwellings offer leafy views of Whitehall Lane’s Leonardini Family Vineyards, while the original Harvest Inn rooms overlook the landscaped garden. 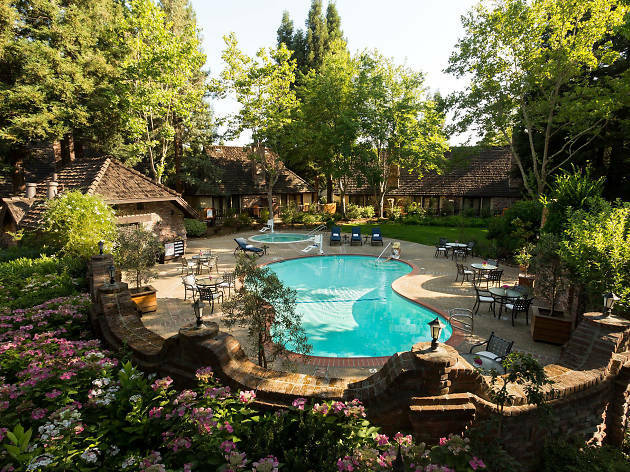 The rooms are elegant and comfortable, decked with brick fireplaces, leather armchairs, Keurig coffee makers, and flat-screen TVs. (Request a room with patio or terrace access.) The grounds, which encompass eight acres, are beautifully manicured and include two heated outdoor pools and whirlpools. Make a reservation at the three-year-old Harvest Table restaurant, which is headed by chef Charlie Palmer and incorporates seasonal ingredients from the Inn’s on-site gardens. 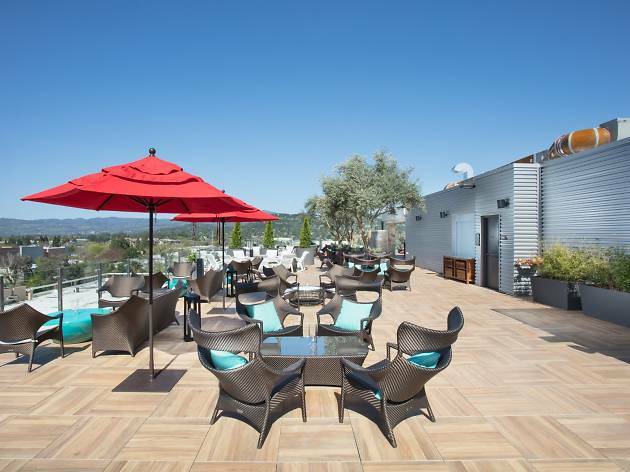 When it opened in November 2017, the five-story Archer Hotel was heralded as the tallest building in Napa. 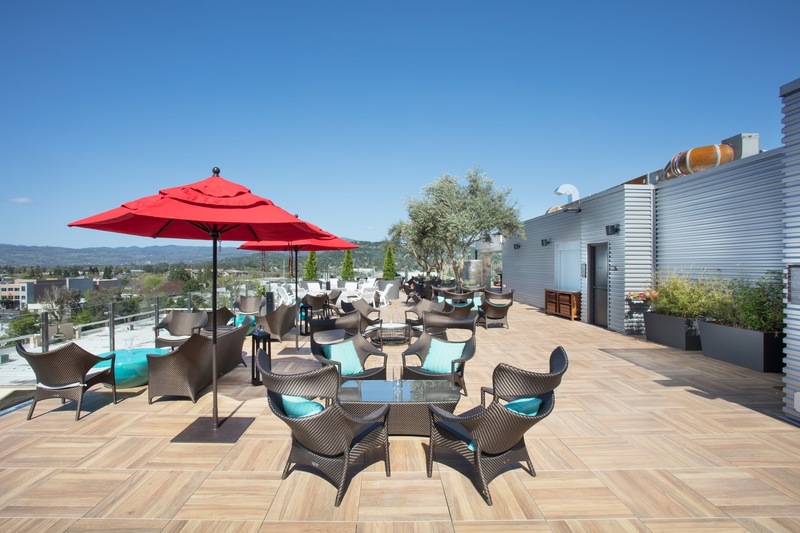 The property makes the most of its height with a swamky rooftop pool, bar, and Charlie Palmer Steak restaurant that provides 360 degree views of the surrounding valley. This modern, stylish spot is a welcome alternative to dated wine country decor; in the lobby, a giant topographical map showcases Napa Valley’s viticultural regions. The pet-friendly boutique hotel includes 183 rooms adorned with white linens, redwood detailing, black and white photography, and leather furniture. 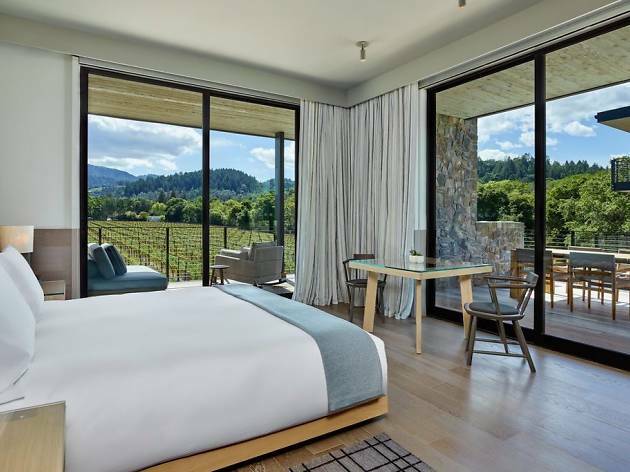 Every room includes a temperature controlled wine fridge—a thoughtful touch, considering its wine country digs. Indian Springs is the antidote to snooty hotels. Originally constructed in 1910, the recently renovated property features 115 accommodations, including rooms, cottages, bungalows, and large residences. The rooms are outfitted with cream-colored linens and wall coverings, accented with furnishings in shades of blue and gold. French doors lead out to your private deck or patio. But at Indian Springs, it’s all about the pool. The Olympic-size swimming pool is heated by four natural geysers to between 92 and 102 degrees. It stays open until midnight for steamy late-night dips. 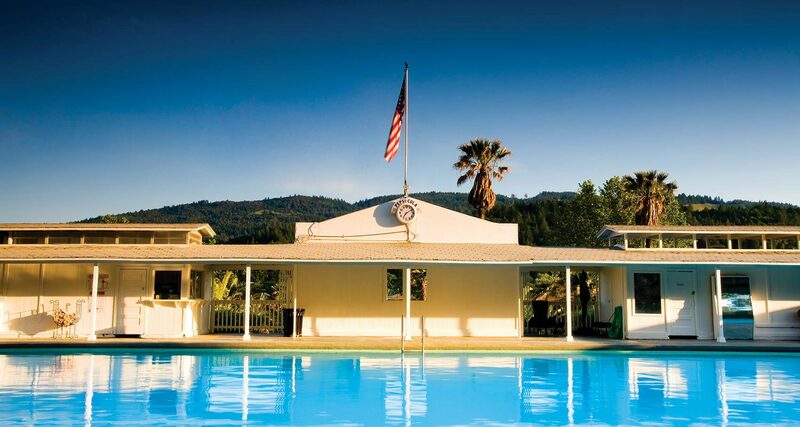 Indian Springs is a great hotel for kids, as well: The pool area features an array games, including bocce ball, shuffleboard, croquet, ping pong, and a lifesize chess board. You’ll be greeted with a cocktail from the bar cart or a glass of hyper-local wine immediately upon arrival at North Block. The hotel’s 20 rooms are masculine and refined, including pristine white linens, wood accents, and leather furniture. Each room includes a private patio or balcony. 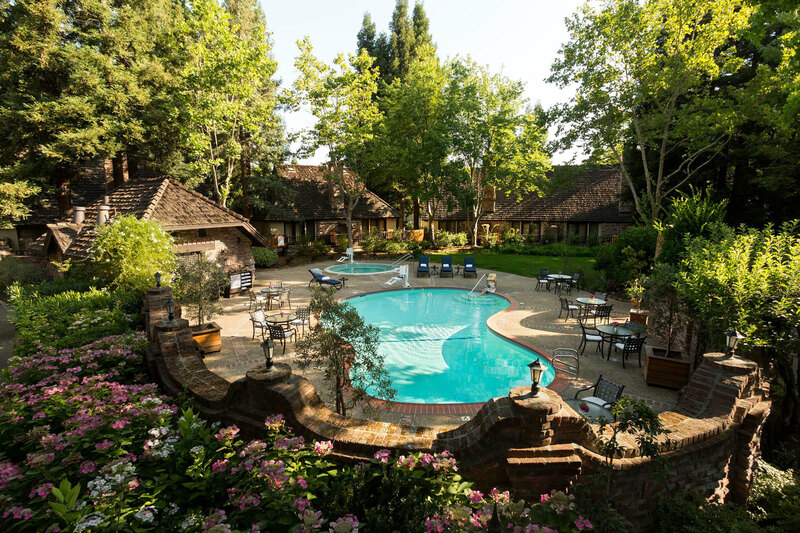 If you’re looking to socialize, the furnished courtyard makes a beautiful hang-out spot on warm nights, as does the radiant fireplace lounge. The spa features a decadent saltwater pool, and the pool area is flanked by ample cabanas. Meanwhile, the Californian-meets-Italian restaurant, Redd Wood, is headed by James Beard nominee Richard Reddington. Additional perks include complimentary pastries from Bouchon Bakery each morning and free bikes for pedaling around Yountville. 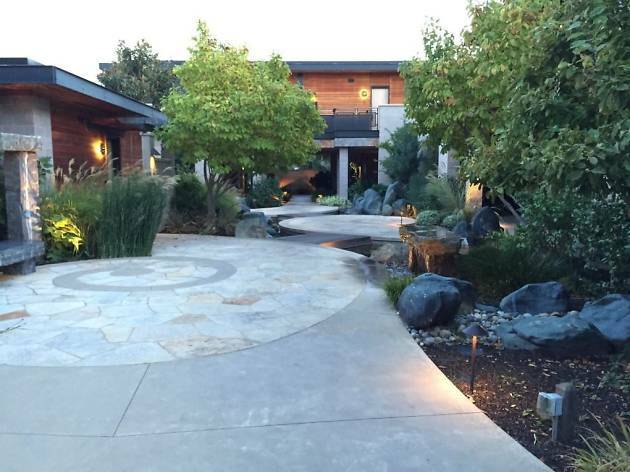 Milliken Creek is a Napa Valley standby with a rich history. The main house was formerly a stagecoach stop in the 1850s; now the 11-room building is a boutique inn with an elegant, throwback feel. The decor within is tasteful, but eclectic, marked by a smattering of antiques, leather armchairs, and wood accents. 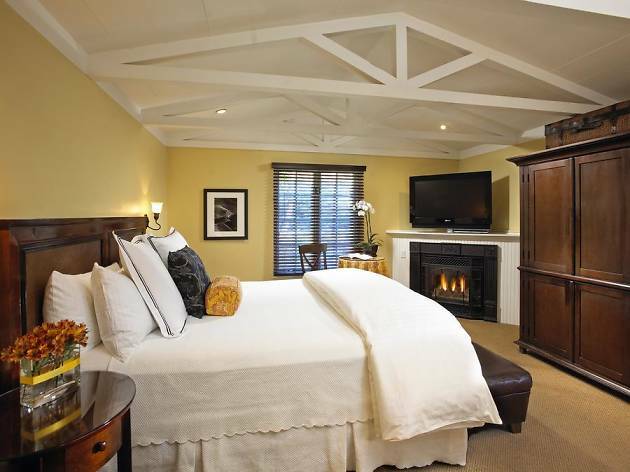 The rooms feature oversized bathtubs and fireplaces; some also have terraces overlooking the Napa river. The three-acre property is awash with flowers, redwoods, and Magnolia trees and makes a scenic spot for meandering or picnicking.